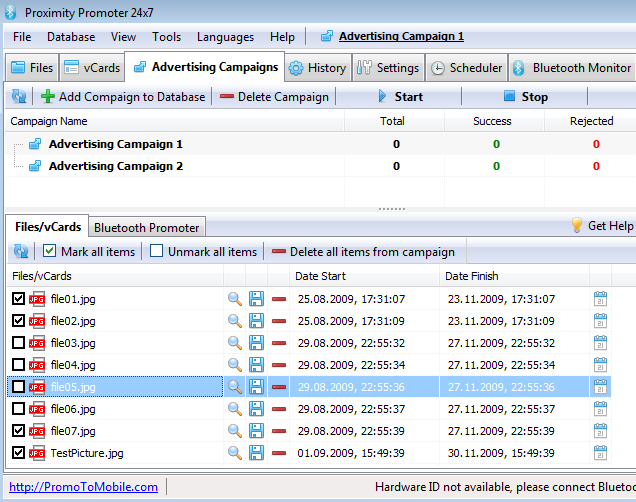 Proximity Promoter 24x7 is software for proximity advertising via Bluetooth connectivity (Bluetooth Marketing). Proximity Promoter 24x7 provides free transmission of any files (TXT, MP3, JPG, 3GP, MP4, vCard, vCal) to any Bluetooth devices (mobile phones, smartphones, hand-held devices, communicators, laptops, mini-laptop computers) via Bluetooth. Does not require any special hardware - only a computer (PC, laptop) and a Bluetooth dongle. You can use "Proximity Promoter 24x7" for distributing your promo materials with no time constraints, i.e. 24 hours a day, 7 days a week, year around, without any additional expenses whatsoever. Does not require any special hardware - only a computer (PC, laptop) and a Bluetooth dongle. Absolutely any files can be distributed; however, keep in mind that the files must be viewable on your customers' Bluetooth devices. Both content transmitted and transmission via Bluetooth are totally free for both consumer and advertiser. Qweas is providing links to Proximity Promoter 24x7 1.25 as a courtesy, and makes no representations regarding Proximity Promoter 24x7 or any other applications or any information related thereto. Any questions, complaints or claims regarding this application Proximity Promoter 24x7 1.25 must be directed to the appropriate software vendor. You may click the publisher link of Proximity Promoter 24x7 on the top of this page to get more details about the vendor.